Mr. Chairman, Mr. Ranking Member and members of this Subcommittee, my name is James Rickards, and I want to extend my deep appreciation for the opportunity and the high honor to speak to you today on a subject of the utmost importance to the financial well being of scores of millions of Americans. The Subcommittee on Economic Policy has a long and distinguished history of examining the validity and efficacy of policies pursued by the Congress, the Administration and government agencies. In the wake of a stock market collapse in 2000, a housing market collapse in 2007 and a banking collapse in 2008, government policy choices to repair the damage have never been more important. Everyday Americans are frightened, confused and in many cases angry at the results of government stewardship of economic policy. A proper understanding of the impact of policy is critical and this Subcommittee is well placed to advance that understanding. As a brief biographical note, I am an economist, lawyer and author and currently work at Tangent Capital in New York City where I specialize in capital raising and alternative investing. My colleagues and I provide expert analysis of global capital markets to investors, fund sponsors and government agencies. My writings and research have appeared in numerous journals and I am an Op-Ed contributor to the Financial Times, Washington Post and New York Times and a frequent commentator on CNBC, CNN, Fox, NPR and Bloomberg. My recent book, Currency Wars: The Making of the Next Global Crisis is a national bestseller. The Federal Reserve began to cut interest rates in 2007 in response to a financial crisis resulting from a collapse in housing values. The Fed Funds rate was lowered from 5.25% in August, 2007 to effectively zero by December 2008 and it has remained at that level ever since. The Fed has declared an intention to keep short-term interest rates at this near-zero level through late 2014. If this intention is fulfilled, the entire course of the zero rate policy will have lasted six years, an unprecedented and extraordinary policy move on the part of the Fed. The Fed’s rationale for this policy has gone largely unexamined and unchallenged. Seasoned economists and everyday Americans have deferred to the Fed’s expertise and have trusted the Fed to do the right thing to fix the economy in the aftermath of the Panic of 2008. The view is that Chairman Bernanke knows best and debate is unnecessary. It should come as no surprise that an unprecedented policy should have unprecedented and unexpected results. There is ample evidence that the Fed’s policy has failed to achieve its goals and is leaving the U.S. economy worse off when compared to a more normalized interest rate regime. Increasing income inequality. Zero rate policy represents a wealth transfer from prudent retirees and savers to banks and leveraged investors. It penalizes everyday Americans and rewards bankers, hedge funds and high-net worth investors. Lost purchasing power. Zero rate policy deprives retirees and those nearing retirement of income and depletes their net worth through inflation. This lost purchasing power exceeds $400 billion per year and cumulatively exceeds $1 trillion since 2007. Sending the wrong signal. Zero rate policy is designed to inject inflation into the U.S. economy. However, it signals the opposite – Fed fear of deflation. Americans understand this signal and hoard savings even at painfully low rates. A hidden tax. The Fed’s zero rate policy is designed to keep nominal interest rates below inflation, a condition called “negative real rates”. This is intended to cause lending and spending as the real cost of borrowing is negative. For savers the opposite is true. When real returns are negative the value of savings erodes – a non-legislated tax on savers. Creating new bubbles. The Fed’s policy says to savers, in effect, “if you want a positive return invest in stocks.” This gun to the head of savers ignores the relative riskiness of stocks versus bank accounts. Stocks are volatile, subject to crashes, and not right for many retirees. To the extent many are forced to invest in stocks, a new stock bubble is being created which will eventually burst leaving many retirees not just short on income but possibly destitute. Eroding trust and credibility. Economics has been infused in recent decades with the findings of behavioralists and social scientists. While this social science research is valid, the uses to which it is put are often manipulative and intended to affect behavior in ways deemed suitable by Fed policy makers. This approach ignores feedback loops. As retirees realize the extent of market manipulation by the Fed they lose trust in government more generally. The effects on retirees and retirement income security are both the intended and unintended results of the Fed’s efforts to revive the economy through a replay of the debt-fueled borrowing and consumption binges of the past fifteen years. Beginning with Fed rate cuts in 1998, which fueled the tech stock boom-and-bust, through the rate cuts of 2001, which fueled the housing bubble, until today the Fed has resorted to repetitive bouts of cheap money for extended periods. This monetary ease has found its way into inflated asset values that in turn provided collateral for debt-driven consumption. These binges drove the economy until the inevitable asset bubble collapses caused a contraction in consumption and launched another cycle. At no time were savers rewarded for prudence. Solutions are straightforward. The Fed should raise interest rates immediately by a modest amount of one-half of one percent and signal that other rate increases will be coming. The White House and Treasury should signal that they support the Fed’s move and support a strong dollar as well. The Fed and Treasury could commit to facilitate the conversion of savings into private sector investment by closing or breaking-up too big to fail banks whose balance sheets are littered with distressed assets. This will facilitate the creation of clean new banks capable of making commercial and industrial loans to small businesses and entrepreneurs. The result, over time, would be to replace a consumption and debt driven economy with a savings and investment driven economy that rewards prudence and protects the real value of the hard earned assets of retirees and near-retirees. Federal Reserve policy today is driven by fear of deflation and its consequences. Deflation raises the real value of debt, which increases the burden on debtors and eventually leads to defaults and acute stress on the banking system. Individuals and institutions increase cash holdings since the value of cash increases in deflation. This creates a liquidity trap and can cause economic activity of all kinds to slow sharply. The Fed insists this deflationary dynamic must be avoided at all costs in a healthy economy. This was the lesson of the Great Depression of the 1930’s as understood by Chairman Bernanke and other scholars. Beyond these inflation-inducing tools, the Fed manipulates the behavior of consumers and savers by setting expectations. Inflation can be identified as the excess of nominal growth in GDP over real growth. Nominal growth is the product of money supply times velocity or turnover of money. Real growth is constrained by workforce participation and the productivity of that workforce. To create inflation, the Fed must find some combination of increases in money supply and velocity that exceeds the growth in the workforce and its productivity. 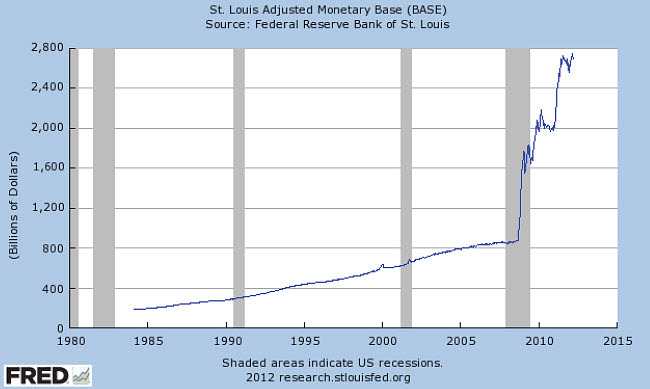 The Fed can increase the base money supply almost at will. The Fed’s problems begin with velocity. If the money supply is increasing but velocity is declining at the same rate, nominal GDP will not change at all. This is the dilemma the Fed has been facing for the past four years. 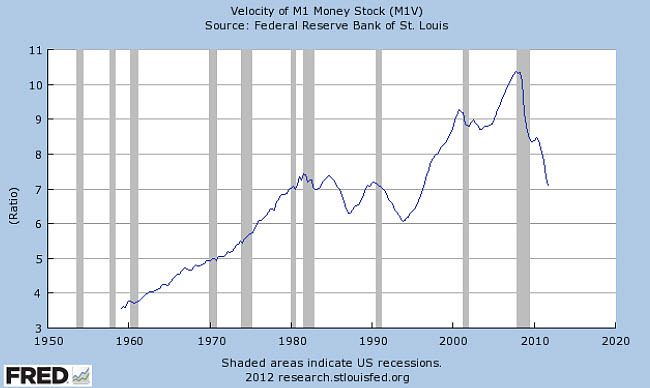 As illustrated in the following charts[ii] prepared by the Federal Reserve Bank of St. Louis, base money supply has more than tripled since 2008, however, velocity has plunged more than 30% in the same time period. Monetary policy can therefore be understood as a “Great Race” between increasing money and declining velocity. The declining velocity greatly hinders the Fed’s ability to pump up nominal GDP to the level needed to cause inflation. The problem with velocity is that it is fundamentally a behavioral phenomenon. This means that the Fed cannot control velocity directly but only indirectly through the manipulation of expectations. Creating inflation that exactly meets expectations and roughly matches nominal interest rates creates no change in behavior because it is already priced into expectations. Another arrow in the Fed’s quiver of ways to increase velocity is the so-called “wealth effect.” The idea is that increasing levels of consumer wealth, reflected mainly in housing prices and stock prices, tend to produce the kind of consumer optimism that results in more spending and higher velocity. The Fed’s efforts to prop up the housing market have produced modest results because of the sheer size of the mortgage debt that needs to be written off, the excess inventory of homes and the difficulty in obtaining mortgage loans given high unemployment and impaired credit scores. The Fed’s efforts to prop up the stock market have been more successful. The popular Dow Jones Industrial Average has almost doubled in the past four years. However, the hoped for behavioral impact of this new bubble has been muted because of relatively low participation by many individuals who lost a substantial portion of their retirement savings in the Panic of 2008 and have remained wary of the market ever since. This wariness was exacerbated by the still unexplained “flash crash” of May 2010. None of this behavioral manipulation can be admitted freely because it clashes with the Fed’s mandate to maintain price stability. More to the point, the Fed cannot acknowledge that its goal is inflation in excess of expectations because to do so would be to change those expectations which would lead to market driven adjustments in nominal rates and reduce the shock effect. This makes the Fed’s goal of changed behavior and increased velocity more difficult to achieve. In summary, the Fed’s goals are to maintain nominal interest rates in the range of zero to 2% while seeking inflation in the range of 4%. The result will be negative real rates that encourage borrowing and an inflation scare that stimulates spending. The combination of lending and spending should increase velocity which, when combined with the already ample money supply, should expand nominal GDP in such a way as to ease the real burden of government debt and reduce the government debt-to-GDP ratio. This policy of slow, gradual inflation and negative real interest rates pursued over a ten to fifteen year period is considered an effective way to erase the burden of government debt without hyperinflation or default. The academic name for this policy is “financial repression.” [iv] This policy of financial repression also involves the use of heavily regulated banks as captive buyers of government debt. The banks have relatively low capital requirements on their government securities holdings and use low cost deposits to fund those holdings. The resulting low risk leveraged spreads provide reasonably high returns on equity for the banks. The Fed’s policy of financial repression, implemented in part through its current zero rate policy is based on flawed economic theory and represents an assault on savers for the benefit of bankers and other leveraged investors. A neo-Keynesian school that places all of its bets on the idea of “aggregate demand” dominates the Fed’s understanding of economics. Aggregate demand is the sum of spending of all kinds including consumption, investment (excluding inventories), government spending and spending on net exports. This spending can be fueled by income or debt. When private spending is too low, government spending can be used as a substitute. When private incomes are too low, debt can be substituted for income. When private debt is too low, government debt can be substituted for private debt. In the neo-Keynesian view, government borrowing and spending step in when private borrowing and spending are inadequate to fill the potential aggregate demand in the economy. In the Fed’s view, savings are the enemy of aggregate demand since any private savings represent a reduction in spending for a given level of income. The result is a war on savings. [vi] The Fed’s policy is to drive savers either to consume more due to wealth effects or fear of inflation or to invest in riskier assets such as stocks in order to earn returns in excess of inflation. The goal is either to increase velocity directly through consumption or indirectly through wealth effects. Retirees and savers who protest that inflation is eroding the real value of their savings are told, in effect, to invest in stocks if they want positive real returns. Yet, retirement savings, represented by relatively safe instruments such as bank certificates of deposit, U.S. Treasury securities, high quality municipal bonds and certain money market funds are not interchangeable with stocks. Stocks are risky, occasionally illiquid, volatile and offer no promise of the preservation of capital. The mantra of “stocks for the long run” lies in ruins after the twelve-year stretch from December 1999 to December 2011 when leading stock indices showed no gains. Based on extreme global monetary ease, there is good reason to believe that strength in stock indices in 2012 is another bubble in the making that will leave investors in tears. In any case, stocks can be highly inappropriate for retirees who should be looking for preservation of capital and steady income to provide income security for the remainder of their lifetimes. Increased income inequality. As inflation increases and nominal interest rates are held artificially low, the real value of retiree savings and the income produced by those savings declines. However, this decline in wealth and income is not shared by all. More sophisticated investors and those who are alert to the tell-tale signs of inflation can weather the storm by incurring debt or investing in hard assets that retain value in inflation such as land, fine art, precious metals and certain companies that own hard assets such as railroads, mines and utilities. These differing responses are the result of gaps in risk appetite and financial literacy. Not all investors are created equal when it comes to an understanding of the dynamics at play and the opportunities for defensive investing. Indeed, many Americans, especially retirees, are all too trusting of the Fed’s pledge to maintain price stability when, in fact, the Fed has reduced the purchasing power of the dollar by over 95% since its founding in 1913. The Fed’s easy retort is that incomes have more than kept pace with declining purchasing power. Yet this is only true on average. Americans are not uniformly average in their experience of inflation. There are winners and losers. In recent decades the winners have been a minority and the losers have been a majority with the result that relative income inequality in the United States as measured by the Gini Coefficient is at an all time high and approaching the levels of Mexico. [vii] Retirees and those nearing retirement are the losers to the extent they seek to preserve capital and avoid risky assets. Lost purchasing power. The Fed’s war on savings is premised on the idea that savings represent a reduction in spending and therefore aggregate demand. This seems to ignore the lost spending from the diminished return on savings. The following chart prepared by Haver Analytics and Gluskin Sheff shows that personal interest income has fallen by over $400 billion per year and over $1 trillion in the aggregate since 2008 as a result of the Fed’s zero rate policies. While not all of this lost income would necessarily have been spent, it seems likely that the propensity to spend would be large due to high unemployment and the diminished availability since 2008 of other sources of funds such as home equity loans. This lost income, once converted into spending, could have added significantly to GDP over the past four years and must properly be counted as an offset to whatever benefits the Fed claims for its zero rate policy. This lost income effect is especially hard on retirees who may lack other sources of income such as wages or business revenues. Fed Policy Sends the Wrong Signal. As described above, the Fed is engaged in an effort to modify behavior by engineering negative real interest rates and an upside surprise in inflation. These are the primary justifications for its zero rate policies. However, the Fed’s understanding of behavioral effects ignores second order effects and positive feedback loops. President James Bullard of the Federal Reserve Bank of St. Louis pointed out this flaw in Fed policy in a seminal paper, “The Seven Faces of ‘The Peril’” published in 2010. [viii] Bullard posits a theoretical dual equilibrium in inflation expectations. One equilibrium points toward higher inflation and higher interest rates. The other equilibrium points toward deflation and lower interest rates. [ix] The Fed intends that its zero rate policy through 2014 should ignite inflationary expectations. In fact, everyday Americans discern the Fed’s fear of deflation implicit in a zero rate and prepare for a deflationary outcome by increasing savings and reducing debt – exactly the opposite of the Fed’s desired outcome. Although Bullard is a “dove” on monetary policy, he recommended consideration of an increase in interest rates precisely to tip expectations in the direction of inflation. Bullard’s insightful analysis suggests that the Fed is its own worst enemy when it comes to stimulating the economy. Inflation is a hidden tax on retirees and near-retirees. When the rate of inflation exceeds the rate that can be earned on savings, a situation that prevails today, the result is a diminution in the real value of those savings. Inflation that exceeds the rate of return by 2% will cut the real value of those savings by 75% in an average lifetime. Inflation that exceeds the rate of return by 4% will cut the value of those savings in half between the time a girl is born and when she goes to college. Rates of inflation of 2% or 4% are not benign, they are cancerous. To hear Chairman Bernanke talk about how he targets 2% inflation but would not be surprised if actual inflation “…might move away from…desired levels…”, as he did in response to a reporter’s question at a recent press conference, is to witness a gun held to the head of savers in America. [x] This destruction of real wealth by government fiat for the benefit of banks is no different than a tax used to redistribute wealth from targets to beneficiaries. Inflation is even better than a tax from a political perspective because it requires no debate, no legislation and no accountability. It requires only the persistence of the Board of Governors of the Federal Reserve in the service of illusory wealth effects and negative real interest rates. Retirees and near-retirees understand inflation for the tax it is. Creating New Asset Bubbles. Real wealth, including wealth in the form of stock prices, comes from innovation, entrepreneurship, hard work, risk taking, savings and investment. It does not come from printing money. The Fed’s efforts to inflate stock prices in pursuit of wealth effects by printing money and manipulating expectations to increase velocity cannot by itself create wealth but can temporarily inflate asset prices into periodic bubbles. Asset bubbles have a feel-good quality while they are being inflated and can temporarily mitigate the worst effects of deflation and deleveraging in the wake of panics and crashes. Yet, in the end, they lead to new panics and crashes and the destruction of bubble “wealth” and real wealth besides. The damage done by the Panic of 2008 has resulted in millions of Americans withdrawing from the stock market in order to protect wealth even if it means negative real returns. Recent advances in stock market prices have proceeded with relatively low volume and narrower participation than past advances. The longer this persists, the more likely retirees will succumb to the temptation to seek positive real returns in the stock market rather than remain in relatively safe investments. This shift will likely coincide with the final phase of the bubble to be followed by another collapse and loss of more retirement savings. There is nothing wrong with investing in stocks that grow based on long-term fundamentals. Yet, stocks are an ill-advised investment for retirees for so long as stock values are the plaything of Fed officials engaged in behavioral experiments. Erosion of Trust and Credibility. The most pernicious effect of Fed policy on retirees and near-retirees is a lost of trust in the Fed itself. The Fed controls interest rates. It influences the exchange value of the dollar. It intervenes to control stock prices. It does so not in pursuit of its mandate of price stability but in pursuit of the behavioral chimeras of velocity, wealth effects and expectations. This is not too difficult for everyday Americans to understand despite the advance applied mathematics and arcane jargon in which such interventions are couched. Again, the outcome is the opposite of what the Fed intends. Instead of increased lending and spending, the Fed is confronted with increased confusion, fear and anger. The result is that scores of millions of Americans try to preserve wealth as best they can through deleveraging and liquid savings even at the risk of wealth erosion due to the Fed’s zero rate policies. It is a false dilemma to suppose that monetary policy is a choice between encouraging savings, which reduces aggregate demand, and discouraging savings to increase aggregate demand through consumption or wealth effects. In a well-functioning banking system, savings can be a source of real returns for savers and a source of aggregate demand through investment. As late as the 1980’s, large money-center commercial banks operating through syndicates made five-to-seven year commercial and industrial loans to finance massive private sector investments in projects like the Alaska pipeline, fleets of Boeing 747 aircraft, railroad rolling stock and other critical infrastructure. These projects were financed in large part with the savings of everyday Americans including retirees. Savers received a positive return on their money and the banks made good spreads and fees on the lending business. The government was not in the business of picking winners and losers although the government did create a favorable investment climate with accelerated depreciation and investment tax credits on qualified assets. The 1980’s were the apogee of sound policy. With Paul Volcker at the Fed and Ronald Reagan as president, Americans could count on sound money, less government intrusion in the investment process and a favorable business environment. America was open for business and was a destination for savings from around the world. Today the United States does not have a well functioning banking system because of repeated regulatory failures by the Fed and other agencies since the repeal of Glass-Steagall in 1999 and the repeal of derivatives regulation in 2000. The conveyor belt between savings and investment traditionally provided by banks is broken. With the repeal of Glass-Steagall in 1999 and derivatives regulation in 2000, the door was open to break down the traditional banking functions and allow banks to become highly leveraged machines for securitization and proprietary trading. Securitization breaks the bond between lender and borrower because the bank cares only about selling the loans not collecting on them at maturity. This destroys the incentive to allocate capital to the most productive long-term uses. Proprietary trading induces banks to trade against their own customers to the detriment of long-term banker-client relations. These conflicts and short-term perspectives came to a disastrous conclusion in the Panic of 2008. Productive private sector investment and capital formation have been the victims. Raising interest rates in stages to provide positive real returns to savers. Banning over-the-counter derivatives that serve no role in capital formation but greatly increase systemic risk. Breaking up too big to fail banks that pose systemic risk. Offering real price stability. Two percent inflation is not benign, it is cancerous. Create a favorable investment and growth climate by ending regime uncertainty in areas such as taxes, healthcare, regulation and other government impositions. The United States, indeed the world, is mired in a swamp of seemingly unpayable debt. In these circumstances, there are only three ways out – default, inflation and growth. The first is unthinkable. The second is the current path of the Fed although it can only be pursued in stealth. The third is the traditional path of the American people. Growth does not begin with consumption, it begins with investment. Only when private productive investment is encouraged and pursued does consumption follow as the fruit of that investment. America’s retirees and near retirees are ready, willing and able to provide the prudent savings needed to fuel investment and growth. All they ask in return is stable money, positive returns and a friendly investment climate. The Fed’s policy of money printing and negative returns is anathema to investment and growth. Until the Fed’s war on savers is ended and reversed income security for retirees will be an illusion. [i] The view that monetary ease can be effected and inflation created even when interest rates are at zero by cheapening the currency was advanced in, Svensson, Lars E. O., “Escaping a Liquidity Trap and Deflation: The Foolproof Way and Others,” Working Paper No. 10195, National Bureau of Economic Research, December, 2003. [iv] See, Reinhart, Carmen M. and Sbrancia, Belen, “The Liquidation of Government Debt”, Working Paper 16893, National Bureau of Economic Research, March, 2011, https://www.nber.org/papers/w16893. [v] For evidence that the government spending multiplier is less than 1 and therefore destroys rather than creates wealth once all secondary effects are accounted for, see, Fredman, Charles; Kumhof, Michael; Laxton, Douglas; Muir, Dirk; Mursula, Susanna, “Global Effects of Fiscal Stimulus During the Crisis,” International Monetary Fund, February 25, 2010; Barro, Robert J. and Redlick, Charles J., “Macroeconomic Effects From Government Purchases and Taxes,” George Mason University, Working Paper No. 10-22, July 2010; and Woodford, Michael, “Simple Analytics of the Government Expenditure Multiplier,” Paper presented at the meetings of the Allied Social Science Associations, January 3, 2010. [vi] The Fed is not unaware of the impact of its policies on the portfolio performance of those institutional investors such as insurance companies and pension funds who have large portfolios of fixed income assets intended to match retirement and other liabilities to their policy holders and beneficiaries. See, Transcript of Chairman Bernanke’s Press Conference, January 25, 2012, question and answer with Scott Spoerry of CNN, pp 26-28, https://www.federalreserve.gov/mediacenter/files/FOMCpresconf20120125.pdf. However, this view is tinged with some derision of those who seek safe forms of savings. In a conversation between a senior official of a large investment bank and a member of the Federal Open Market Committee, the FOMC member justified the economic damage to pension funds and insurance companies caused by the Fed’s zero rate policy by saying, “..they’re not systemic…”. In other words, the Fed views its mandate as propping up systemically important too big to fail banks even at the expense of the institutional retirement savings industry. [vii] CIA World Factbook, U.S. Government Printing Office, 2010. [ix] Bullard’s dual equilibrium model bears some resemblance to the dual equilibrium between monetary expansion and contraction posited by Ben Bernanke in his landmark paper, “The Macroeconomics of the Great Depression: A Comparative Approach,” Journal of Money, Credit and Banking (1995). [x] See note 3, op. cit.